Any space or area in your home can be made dark to enjoy a black light party where only a few minor adjustments are necessary. First, secure a good area then cover all areas where lights can pass through. An example would be covering the window with a huge black cloth to ensure that the area becomes as dark as possible. 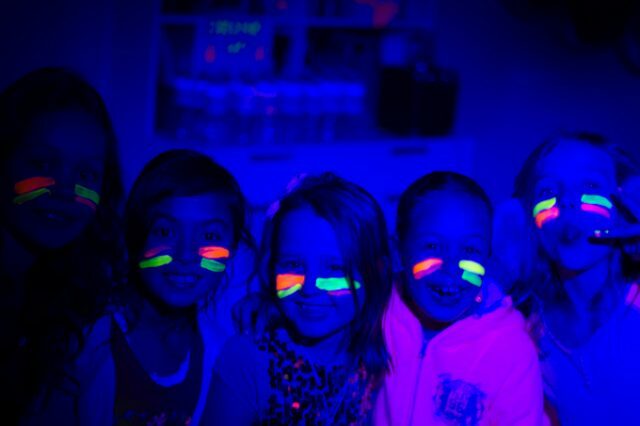 Aside from using glow sticks, you can add a few other glowing decorations to your glow party; these usually come in LED or ordinary light bulbs. Also, you can make use of your kids’ Whistlecopter toys such as the Clown Fish Bubble Guns and their Star War Laser Sword to add more lights and fun to the glow party since these toys feature some of the brightest LED lights you could ever find. If you are able to find bright colored or neon glow in the dark accessories at very affordable prices; make use of this to make your glow party even more fun. You can purchase neon colored bracelets, sunglasses, plastic rings, and more! One fun, amusing, and unexpected way to further enhance your dark glow party is to serve black light responsive drinks that glow in the dark. These drinks are usually white which are milk and cream based, or clear tonic water-based drinks. If your black lighting is good, the milky drink will glow different colors while the tonic water will glow a beautiful cool blue shade that can easily help guests find their drinks easily. When there’s a party, you should have great music to make it completely fun and entertaining. If you want to bring that “rave” feel during your glow party, choose the classic house/techno or modern electronic dance music to your playlist. Generally, any type of music will be great for your glow party, as long as everyone enjoys the music then you’re all set.